Indians Baseball Cards: Blog Bat Around: No Tribial Matter! 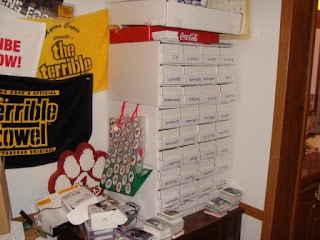 I don't consider myself a neat freak (by any stretch of the imagination,) but I had to copy the picture of your team boxes and rotate it 180 degrees. It made me feel much better. 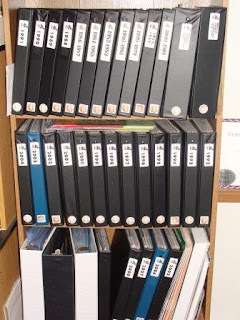 All of your photos give me that gnawing feeling that I need to buy binders and sheets. But compared to buying cards, it's so dull! 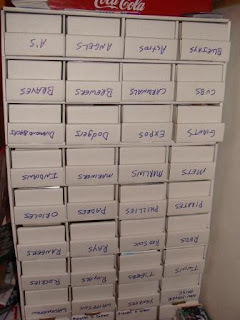 Labelled folders, labelled boxes of trade cards, boxes of assorted cards. 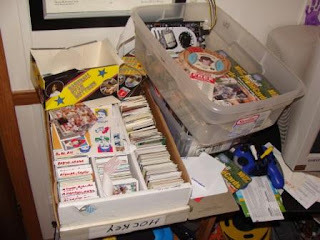 It was like looking at my own 'baseball' section of the house! What kind of nVidia card do you have? After reading your post I felt like I had written it !! Your collection and mine are very eeriely similar.I too have the goal to have every Indian card ,but as you said , it's pretty much impossible but it still gives me something to strive for and keeps me going.I'm new at this blog "thing " and I'm still learning how it all works ! Some of you may be familiar with " Intelliracer " from ebay and other trading sites. He also has a blog " Cardboardmania " which is on hold due to his college education. Well, he is my youngest son ! Great Post! 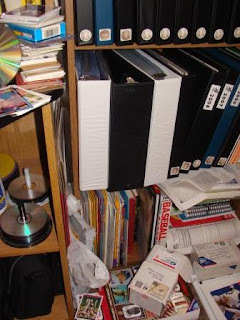 Man you are pretty well organized, much more than I am. I love the upside down boxes thats pretty funny. So you're an Indians fan AND a Steelers fan? Why not the Browns?